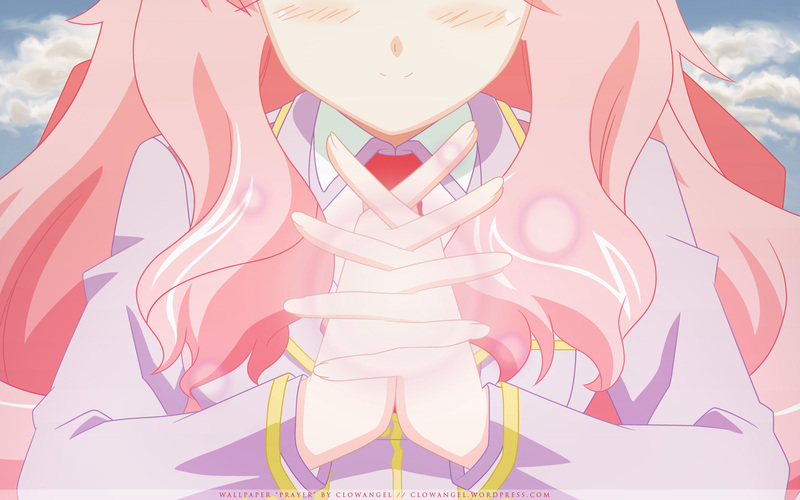 I started this wallpaper back when Baka to Test to Shoukanjuu first aired. If you've watched the anime, you'll recognize this was from the OP. Unfortunately, the anime did not capture my interest and thus I forgot about this project. While going through my Projects folder, I uncovered and completed it. Reading CyanideBlizzard's suggestion, I changed a few things. Though I tried to update the wallpaper, it wouldn't update... so I uploaded the one with changes as an alternative. The 'smoke' now looks more like clouds, and I've toned down on the bubbles. I didn't want to get rid of them. Personally speaking, I'd of love to seen the bubbles around her removed. While they don't greatly distract from the wallpaper itself, it doesn't allow the viewer to fully focus on the character. That, along with the background. I'm not too sure if it's suppose to be smoke, or clouds (it looks more like smoke). However, despite all of this, it's actually a rather cute desktop. I always wondered if someone would turn this into a wallpaper or not and I'm glad someone actually did. The vector work isn't too bad either, although the colors come across as a bit blinding, it's still rather nicely done. If you work on the two previously mentioned changes, I think it would really tighten up this wallpaper in general and make for a very relaxing background. Otherwise, nicely done! Vector is clean and i like the sharp colors with soft feeling in it. The background is simple but i do love how you focus on the character. The glowy things are nice touch and they're not too distracting. Thanks for your good PIC ~~!